Every so often, groupthink has its moments of beauty. 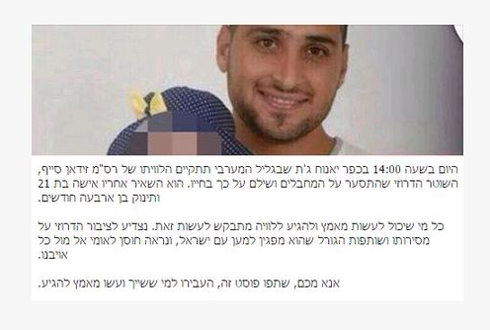 During the murder spree at Har Nof yesterday, the Druze cop who killed one of the murderers was himself shot in the exchange. He died today. His name was Zidan Sayaf, a Druze, and Haredim are now calling for a mass attendance at his funeral, to lay him to rest at his village in Jath Yanuah at 2pm today. The Facebook post is below. The funeral for First Sargeant Zidan Sayaf, the Druze policeman who attacked the terrorists and paid with his life, will take place today at 2:00pm at Yanuah Jath Village in the Western Galilee. He leaves behind his 21 year old wife and a fourth month old baby. Anyone who can make the effort to come to his funeral is requested to do so. We will salute the Druze community for its sacrifice and its tying in its destiny to Am Yisrael, and we will present a united front against our enemies. Please, share this post, pass it along to the appropriate people, and make an effort to come. A Druze soldier doing his duty to protect Israel from its enemies who is killed by Ishmaelites while on duty protecting Israel, it is appropriate to mention his name in synagogue in a prayer for the dead, as is the custom for all righteous gentiles. Now, as nice and right and just as that is, don’t confuse me for someone who gets all sentimental about “Our Loyal Police Force” and “Our Heroic First Responders” and jumps from there to glorifying the State Security Apparatus and lobbying the Knesset to increase the police budget. Zidan was not being a cop when he went in there to fight murderers. He was not being a Druze either. He was being a human being. I praise him as a human being fighting to protect other human beings. Not as a cop protecting citizens of Israel, and not as a Druze protecting Jews. Besides, the shul should have been protected by a private security company, not a tax-funded state-backed inefficient monopoly police force. If any potential murderer (notice I never use the word “terrorist” because it is a meaningless term) were to try to come to my town and shoot up a minyan, he wouldn’t survive two seconds. Everyone in my town is armed to the teeth. Unfortunately, Haredim are not the types to arm themselves, because they rely on State institutions for everything. Hopefully some of them will wake up now and start packing heat. ← PSEUDO SCIENCE What do Climate Scientists and Keynesian Economists have in common?